William Butler Yeats has a Legacy Library. Legacy libraries are the personal libraries of famous readers, entered by LibraryThing members from the Legacy Libraries group. » William Butler Yeats's profile. William Butler Yeats's book Enter At Your Own Risk: Old Masters, New Voices was available from LibraryThing Early Reviewers. W.B. 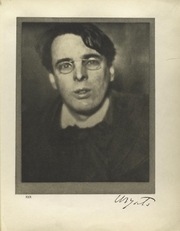 Yeats Society of N.Y.
William Butler Yeats is currently considered a "single author." If one or more works are by a distinct, homonymous authors, go ahead and split the author. William Butler Yeats is composed of 59 names. You can examine and separate out names.